Hurricane Ike visited Galveston Island with devastating results for the people and infrastructure. 40, 000 trees were killed during the storm surge on the island leaving the landscape bare. In an unusual and creative action Galveston Island Tree Conservancy member Donna Leibbert found chain saw sculptures to create dead tree sculptures from the dead trees in the historic district. What was a terrible eyesore and reminder of the horrors of Hurricane Ike now is a charming visual sight to the eyes! If you are visiting Galveston soon you must tour the city to see these beautiful works of art! 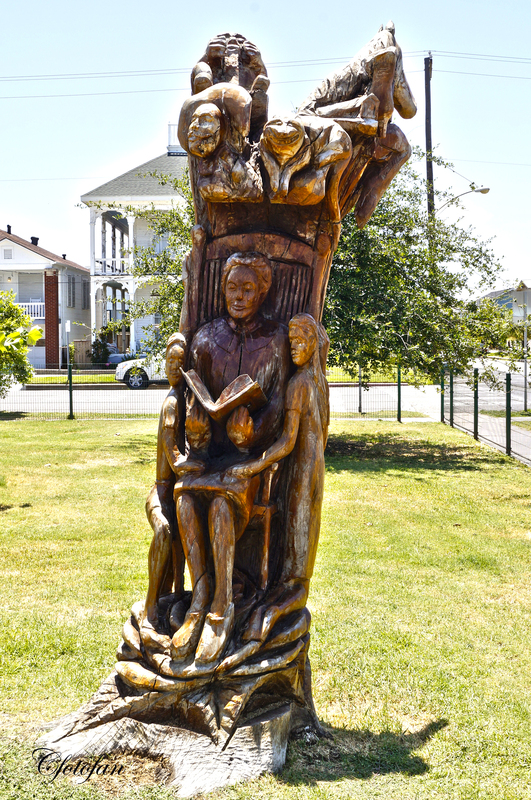 Galveston Island Tree Conservancy member Donna Leibbert petitioned city hall for permission to have the trees used as sculptures at city hall but the city was not at first in favor, fearing that the sculptor might get hurt and the city would be liable. Eventually Ms Leibbert was able to gain support for her project and a new tourist attraction was born. Others in the city were heart broken at losing their beloved trees that had been part of the historic district for many years. While most Galveston natives approve the project there has been concern that inaproppriate images might be chose. Taste is subjective and some fear the historic character would be changed if the carvings were permitted on the divided Broadway esplanade where hundreds of live oaks on the center divide were killed during the storm surge. Although the Texas Historic Commission is unlikely to give permission for the Broadway esplanade project, the Conservancy has begun fund raising to create dead tree sculptures at Adoue Park and Jones Park and needs between $3,000 and $5,000 to complete the project. Artist James Phillips who lives in Clear Lake, Texas donated his time for the first sculpture. Local artist Earl Jones has done work on a number of sculptures. The dead tree sculptures can be found all over Galveston island on every street and corner. The artists took the time to look at each tree and find the inner heart that turned the trees into mermaids, dolphins, squirrels, dogs and even angels. These sculptures are truly spectacular and will stand the test of time and the weather. They are worth a visit. This entry was posted in captures, cultura, culture, diversión, exposición, fotografías, fotos, fun, gallery, Images, imágenes, naturaleza, nature, photos, pictures, travel and tourism, turismo and tagged Donna Leibbert, esculturas de árboles muertos de Galveston, Galveston, Galveston Island, Galveston's dead tree sculptures. Bookmark the permalink.